Welcome to the first of Bottles and Extras' quarterly columns dealing with the fascinating world of pre-prohibition shot glasses. Often relegated to the areas of "go-withs" or "extras" by many bottle enthusiasts, shot glasses have a very lively and growing following of their own. This inaugural column will be devoted to an overview of the topic and recent changes in collecting habits brought about by the internet and by eBay especially. It used to be that there were "glass-rich" areas and "glass-poor" areas. eBay has pretty much changed all that. One of the things I want to do in this issue is to share some data I've collected on eBay shot glass auctions over the last four years. It may drive home the impact the web has had on collecting. As we go to press, the number of auctions for pre-prohibition shot glasses on eBay has gone over the 7,000 mark for the time frame covered: i.e. from mid 1999 to now. This number includes close to 3,000 different brands, distillers, dealers, saloons, hotels, etc. Of these 3,000, the number of different glasses that have appeared once and once only is about 1,600. Now, those are pretty scarce! From there, the frequency rises all the way up to the 297 Hayner glasses that have popped up like dandelions all over the place. And in between lie the classic shot glasses that cover most collector's shelves. This would be a good time to clarify what I mean by a "glass" and what I mean by "pre-prohibition". The usual shot glass is thin walled and stands about 2" high and about 1 3/4" across the rim. 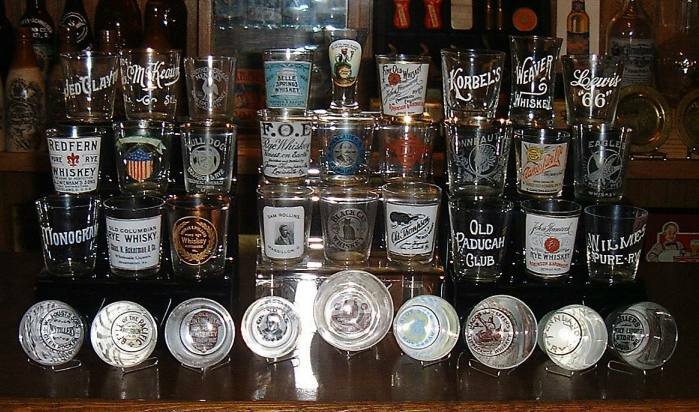 Many collectors include tonic shaped glasses and high ball glasses, which can run up to 4" tall. And, we're talking "spirits" here. (Beer glasses, soda glasses and dose glasses have their own followings). 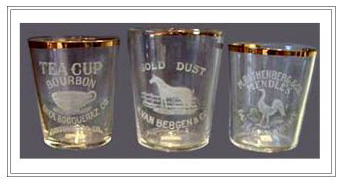 The term "pre-pro", when applied to this type of glass, indicates a date range between the mid 1890's and 1919, with the bulk of them falling into the heyday of the sample glass - the twelve year period between 1904 to1915. Of course, exceptions abound to all of these standards. And often, distillers and dealers used whatever sizes the nearest glass maker had on hand or on sale. So, how many different glasses are out there? 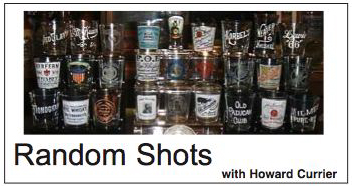 The "bible" of the pre-pro shot glass collector, fittingly, is comprised of two books: Historic Shot Glasses - The Pre-Prohibition Era, published in 1985 and revised in 1992, and Old Advertising Spirits Glasses , published in 1988. Both were written by Barbara Edmonson, to whom every pre-pro shot glass collector owes unending tribute. The revised edition of the former title (HSG) is available in book stores and through www.pre-pro.com ($20, shipping included). Sadly, the second title (OASG) is out of print. It sometimes surfaces at auction on eBay and is quickly grabbed up. Together, the two books list over 3,200 entries. Of the glasses I've gathered into my database, 1,700 are not listed in the Edmonson books, so that brings, at minimum, a total of close to 5,000 and that, I feel, is just the tip of the iceberg. Usually, this is fairly easy. After all, these were given out as a form of advertising, so virtually all dealers, saloons and distributors let you know where to find them right on the glass. Frequently distillers, laying claim to trade mark ownership, put the name of the distillery beneath the name of the brand. But sometimes they didn't and that's where the fun of researching the information comes into play, much like it does with bottle collectors. The Edmonson books are the first resort. Quite often, she's already done the work for you. And just this past year, Bob Snyder has made the results of years of research available in his multi-part binder, Whiskey Brands. This is available directly from Bob at 4235 West 13th, Amarilo TX 79106. A good investment for the serious collector. Of those 3,000 glasses I've catalogued, I was a little bit surprised that over a third (1,022) came from just four states: Kentucky, Missouri, Ohio and Pennsylvania, all represented fairly equally. And two cities alone, Louisville and Cincinnati accounted for over ten percent of the total number.